Well, the show is over, everything was packed, shipped home to be unpacked again. It was a wonderful experience being in Santa Fe and we met some wonderful new people and got to visit with old friends as well. 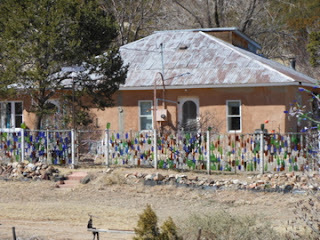 We also had a chance to visit and experience the areas around Santa Fe - will be sure to add some pictures from our journeys. For both Joy and me, it was awesome and inspiring. Wish I had a both shot to share but here's a cool house in Madrid - great way to recycle. But thanks to those who came by and visited and shopped with us. We hope to hear from you soon. Fire Foxes will be at BeadFest Philly in August - details to come.